The term webworm is used to describe several insects whose caterpillars use silk to join plant parts together to form protective nests. 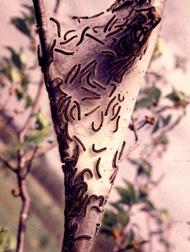 Two common insects that create nests in fruit and woody ornamental trees are the eastern tent caterpillar and the fall webworm. These insects should not to be confused with the forest tent caterpillar, whose name is a misnomer, because it does not make a tent. Both eastern tent caterpillars and forest tent caterpillars are often mistaken for gypsy moth larvae because of their similar appearance. Plants Attacked and Damage: Hosts of the eastern tent caterpillar, fall webworm, and forest tent caterpillar are similar. Eastern tent caterpillars prefer plants in the rose family (Rosaceae) such as wild and landscape cherry, apple, crabapple, plum, and peach, but have also been found in ash, birch, willow, maple, oak, and poplar. Eastern tent caterpillars are generally active from April until early June, and they typically make their nests in the forks of branches when leaves are newly developing. Fall webworms feed on almost all shade, fruit, and orna¬mental trees except conifers. They are active from July through September, and typically make their nests in branch tips. Forest tent caterpillars prefer wild cherry, but also feed on oak, maple, hawthorn, and numerous other shade trees. Forest tent caterpillars do not make nests, but feed in the upper portion of trees on expanding flowers, leaf buds, and eventually foliage. 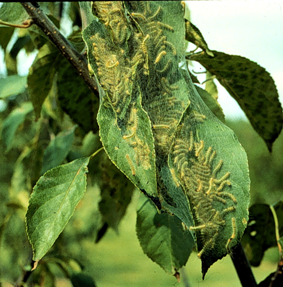 Control: Eastern tent caterpillars, fall webworms and forest tent caterpillars rarely reach large enough populations in ornamental trees to cause serious damage. Typically, trees can recover from feeding damage. However, nest and feeding damage can lower the aesthetic value of a tree. In addition, repeated defoliation year after year may contribute to tree decline. 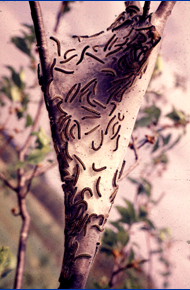 On small trees, webworm nests can be removed or pruned out. Simply scrape or prune the nest off onto the ground and crush to destroy the caterpillars. Remove nests in the early morning or late afternoon because more caterpillars are located in nests at these times. 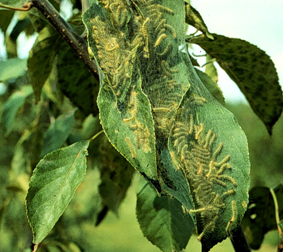 In larger trees, insecticide treatments may be necessary. Treat small, young caterpillars while they are inside the nest in the morning or late afternoon. For more information: Contact your county Extension agent.